Vinci Housewares was founded in Southern California by a team of engineers obsessed with perfecting the tools we use in the kitchen. 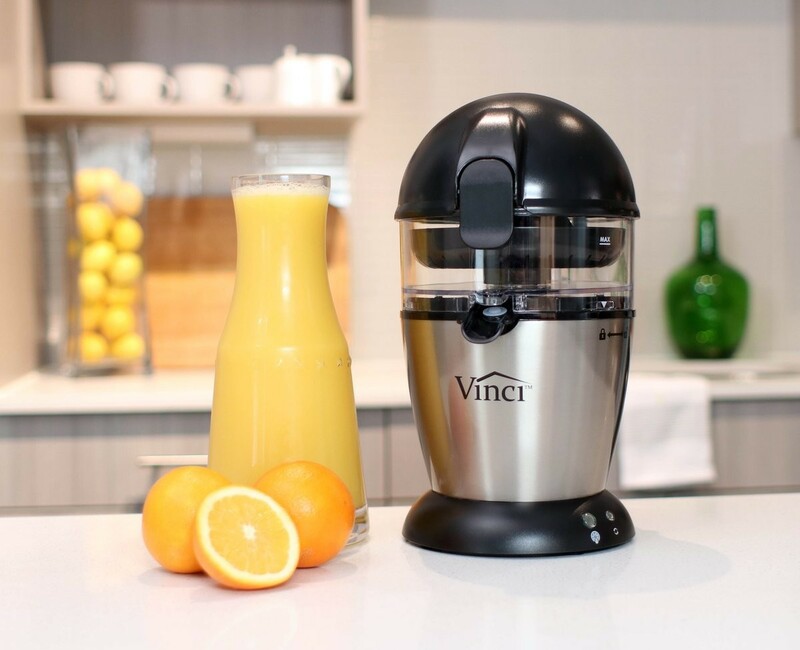 By combining their previous product success and retail know-how, Vinci is poised to launch several new housewares products in 2019, beginning with the Hands Free Citrus Juicer. What makes the Vinci Hands Free Citrus Juicer different? Our SMART, Patented, Automatic Juicing Mechanism and the Vinci Pressure Sensitive Juicing Technology. Using the Vinci Hands Hands Free Citrus Juicer, all you do is SLICE the fruit in half, PLACEthe fruit on the reamer and PRESS the juice button. Our Smart Juicer automatically extracts the optimal amount of juice (without breaking into the rind which can make citrus juice bitter) and with no sticky or wet hands! The result is delicious, fresh, perfectly juiced juice! Why Make Another Citrus Juicer? In seeing the issues common with other citrus juicers, our mission was to perfect the process of citrus juicing. Where some juicers are messy, difficult to use, inefficient, and bulky, we solve all of those issues with the Vinci Hands Free Juicer. We at Vinci Housewares are committed... no, obsessed with engineering the very best possible housewares products for your home. We marry technology and engineering to make products we can truly stand behind. We believe in this product so much with Vinci’s high standards, that a full One Year Warranty is provided. With our Patented Automatic Juicing Mechanism, there is no need to hold the fruit, strain your arm, or make a mess; the High Torque Motorized Base automatically raises the Juicing Reamer and Filter to extract the freshest juice possible in about 10 seconds - totally hands free & mess free! 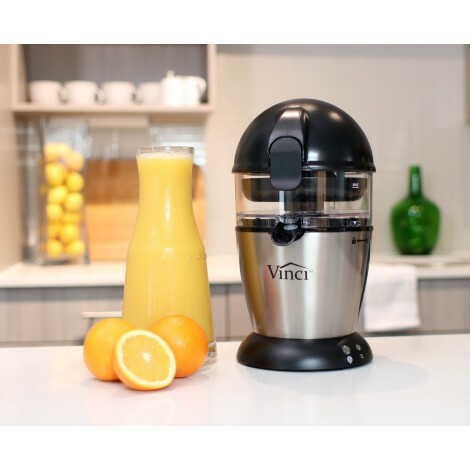 The Vinci Hands Free Citrus Juicer is the ONLY citrus juicer with Pressure Sensitive Juicing Technology. With this feature, our built-in sensors automatically sense the thickness of the citrus rind, ensuring you always get the best and optimum amount of juice without any bitter flavors that are often introduced when the rind is scraped by the reamer by other juicers. Each Vinci Hands Free Juicer comes with two easily interchangeable pulp filters so that you can enjoy your citrus juice the way you like it, with either low pulp or high pulp. When you are done using the Vinci Hands Free Juicer, the simplicity of use continues with clean-up and storage. All parts that are used to hold and extract the juice remove easily and are dishwasher safe. When you are ready to store your Vinci Hands Free Citrus Juicer, it stores compactly in most kitchen cabinets. And maybe even using in your craft cocktails. Be one of the first to have the next generation of citrus juicers by ordering your own Vinci Hands Free Juicer today. From conception to execution, we are so excited to say that we are almost ready to ship our Hands Free Juicer.